As a performance coach it’s my primary goal to maximize the potential of the wrestlers I train. Thus far I’ve been fortunate to work with a number of very high level competitors. So while I’ve had the opportunity to be around wrestlers who are about as successful as you can be, it wasn’t until tonight that I figured out what the common trait is between them. I’ve always been aware of it, but it really hit me tonight. Specifically just how humbling it can be to have wrestlers who drive such long distances multiple times a week to train with me. I don’t know why it hit me tonight, but at one point I looked around my gym and realized there were 3 guys there who had all driven over 45 minutes to work with me. It’s hard for me to put into words, but it feels awesome. Then I got to thinking and realized that this has been going on for over 10 years now. In fact, I’d like to take a moment to sing the praises of some of the great men who I’ve had the privilege to work with. It all started with J.P. O’Connor. Although I had written him programs throughout his high school career, once I graduated from Ithaca College in 2006 we were finally able to spend a summer training together. He drove over 45 minutes each way 3 times a week to train in my parents basement. This is back when I had very limited equipment. As I look back on it, his level of commitment as an 18-year-old amazes me. The fact that he commuted such a distance 3 times a week to train with me was, and still is, a true honor. Cody started with me the summer going into his Junior year of high school. He consistently trained with me 3 times a week until he graduated. In fact, he still comes to my gym and follows my programs (and now implements that as an Assistant Coach at Binghamton University). He drove over 45 minutes each way those last 2 years of high school. During that time he went from being an average wrestler to placing 6th in NYS his Senior year. He then went on to sign with Binghamton University, which at the time, was a top-20 Division 1 team. He earned a starting spot and became a NCAA qualifier by his Redshirt Sophomore year. He then earned a full scholarship as a Redshirt Junior and again qualified for the NCAAs. 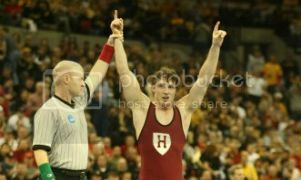 He finished up his college career as a 3 time D1 qualifier and was a round away from being an All-American 3 times. Donnie Vinson followed my programs and spent the Spring and Summer months traveling about 40 minutes each way during his final 3 years in high school. While at BU, he placed 3rd at the NCAAs his Junior year and was ranked #2 throughout his Senior year. I worked with Kyle as a 9th grader and wrote programs for him throughout high school. The summer going into his senior year he was able to start making it down to my gym. With his new driver’s license, he drove an hour and 15 minutes each way once a week to train with me. In addition, he would follow the workouts I would give him throughout the week. He never made an excuse as to why he couldn’t get it done. Not everyone can be like those guys above, and I understand that. But it’s still a little confusing to me when some of the wrestlers I train share their goals with me and then regularly find excuses to not come and lift, even when they live only 10-15 minutes away. But will they reach their true potential? Based on “the secret” difference that I’ve discovered, no. It’s actually something that Georges St. Pierre told me years ago when I had the chance to train with him. So what do the 4 guys above have in common? You’ve got to be willing to go that extra mile to prepare. So the next time you want to skip lifting or an extra drill session because “practice was tough” or “you’re tired and sore” think about what the 4 guys above would do…and then get to work! Too Focused On Being A Winner?? Thanks Shawn. If you have a second, could you help me spread the word by sharing it on your Facebook? Thanks for the help and for the comment man. 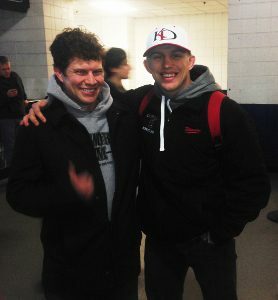 Great article Dickie, I have been training my son who is a sophomore at Delbarton High School. My is Son is always willing to go the extra mile the problem we are having is fatigue. Between matches, practice six days a week. wight training and a school regiment similar to Harvard. can you help me with rest, recovery and nutrition. Hey man, great to hear this post will help to keep you inspired. Keep me posted with how your training is going and best of luck in MMA.